Fashion mogul Edith Flagg passed away last week in Los Angeles at the astounding age of 94. Who is Edith Flagg you may ask? Well, she’s the woman who brought polyester to the United States. I must admit, I didn’t know of Mrs. Flagg until she graced my television as Grandma Edith on her grandson Josh Flagg’s Bravo TV show Million Dollar Listing (2006-present). But to watch her was to love her. Flagg was a Romanian Born fashion designer. She was raised wealthily, but when Hitler came into power her family lost everything. 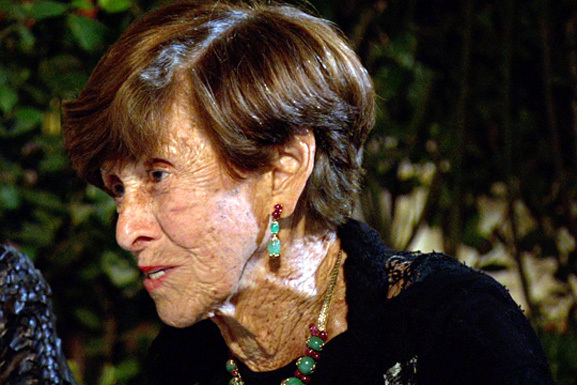 Edith was a Holocaust survivor and lost her husband to Auschwitz. She fled to safety as a young mother and ended up in America with $5 on her pocket. She worked for a while as a seamstress, but in the 1960’s on a trip to England, she discovered a fabric that would change the very face of fashion. She found polyester. After purchasing as much of the fabric as she could get her hands on, she created a garments that were washable and perfect for every woman. Within a year, polyester was all over the country. Her grandson Josh Flagg who not only spoke of his grandmother as his best friend also gave us insight into not only her brash sense of humor and her worldly business advice. Grandma Edith had a take no prisoners attitude and clearly taught her grandson those same important traits. Edith was once famously known for purchasing a $100,000 Rolls-Royce cash after the salesman doubted her ability to do so. With all of Grandma Edith’s opulence though, there laid a humble woman. Here is a brief interview with Josh speaking about the book he wrote about his grandmothers life. I know this will be my next read. We salute you Edith Flagg. Posted in Culture, Fashion and tagged Beverly Hills, eccentric, Edith, Edith Flagg, Fashion, Fashion mogul Edith Flagg, Flagg, Grandma Edith, Holocaust, Holocaust survivor, Josh Flagg, Los Angeles, Million Dollar Listing, Mogul, Polyester, Style, Visionary. Bookmark the permalink.